Take a long piece of floss (I prefer waxed) and wrap it around your fingers. Then place it between your teeth and move it towards your gums. 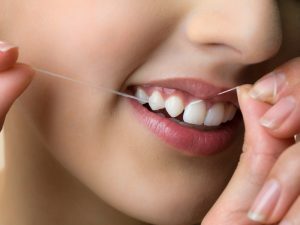 Go all the way down and shape the floss like a ‘c’ while you hug the tooth. Then massage your gums back and forth with the floss. Move it up and down as well. Do this on either side of the triangular piece of ‘gum’ that rests between the teeth. Try to give the gums a good work out. If they bleed or hurt, just keep doing it. Eventually the bleeding will stop as you continue to work the gums out. In addition, as you toughen up the gums, they will stop hurting. I always tell my patients that they have to turn a ‘rare steak in to a medium’ one. We don’t want our gums to be red, inflamed (puffy) and bleed quite readily. Instead, we want them to be pink, tight and not bleed at the mere touch of a piece of floss. Most people actually floss before and after their cleaning appointment. Before, because they feel self conscious of how clean their mouth is and after because they’re keen and motivated. But, it seems to wane shortly thereafter. My belief is that flossing has to become a ritual, such that if you don’t do it before you go to bed, you won’t be able to fall asleep. I floss about 10 minutes every night and the majority of time, I focus on massaging my gums. But, at the same time, I am getting rid of any food particles or plaque that has accumulated within the 24 hours since I last flossed. In addition, it’s always beneficial to brush after flossing…Why? Because by cleaning out food particles caught in between the teeth, the toothpaste can now enter these areas and clean and fluoridate them. Remember: it generally takes about 24 hours for the filmy paste of plaque to reappear. Sometimes, patients come to an appointment about a week or 2 after their cleaning and I may notice that they have a lot of plaque in their mouth. When I tell them that they need to improve their oral hygiene, they often say, “but I just had a cleaning 2 weeks a go”. I then tell them that plaque can reappear after 24 hours and the cleaning at our office just gets them to a good starting point. In a nutshell, brushing and flossing, along with regular dental cleanings, are good habits to get into. Call us today at (905) 791-3867 to learn more about proper oral hygiene and to book your next dental cleaning. Practicing dentistry for over 23 years, Dr. Robert Axelrad owns and manages his own dental practice in the heart of Brampton, Ontario. Affectionately known as ‘Brampton’s Gentle Dentist‘, patients include children, adults and seniors. Dr. Axelrad recently moved his practice to its current, state-of-the-art dental office at Bestgate Professional Center in Brampton, Ontario in 2002 to accommodate his growing list of happy patients.